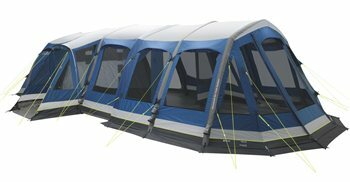 Our superb Smart Air TC Collection has established itself firmly as the leader in the family tent market by combining high quality fabrics, inspired designs and exceptional innovation. 2016 sees further exciting developments that home the cutting edge performance of our impressive inflatable tents. The advanced air tube system with one go inflation technology ensures fast, straightforward and reliable pitching through one valve for the inter-connected tube frame that creates fabulous internal space and superb stability. Demonstrated of the speed and ease of pitching never fail to impress onlookers by delivering piratical proof of top performance. They're great fun as well for potential buyers! Further improvements in stability have been achieved by the gothic-inspired design of the pre-angled frame construction. Our new masters Bedrooms deliver more headroom and floor space with the bonus of window strips that offer great views. The new Aeroffective Ventilation System ensures a fresh atmosphere inside and a sleek profile outside. Proud owners will relish the stylish luminous piping and our Outtex 6000 embossed polyester fabric that sets them apart from the crowd on site.